By request, I’m republishing this interesting post. Here’s one of the weirder procedures I’ve seen in some time. Imagine that you need a definitive airway, but you can’t use the face for some reason (mouth or nose). The usual choice would be a tracheostomy, right? But what if you only need it for a few days? Typically, once placed, trachs must be kept for several weeks before decannulation is safe. Enter submental intubation. 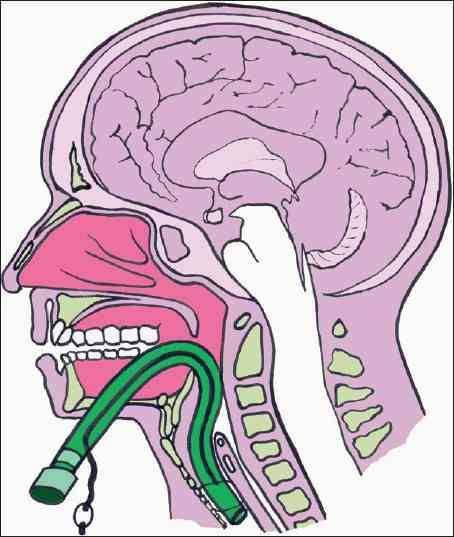 This technique involves passing an endotracheal tube through the anterior floor of the mouth, and then down the airway. This leaves the facial bones, mandible, and skull base untouched. The technique is straightforward. After initially intubating the patient orotracheally, a 1.5cm incision is created just off the midline in the submental area. Using a hemostat, all layers are penetrated, entering the oropharynx just lateral to the tongue. A 1.5cm incision is then made parallel to the gum line of the lower teeth. 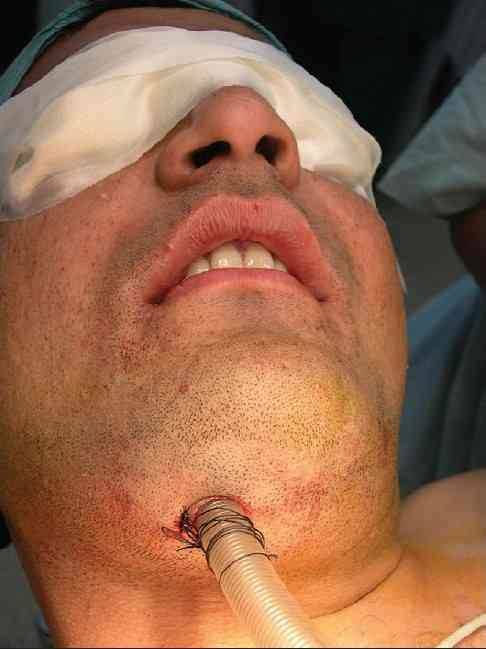 The connector at the proximal end of the endotracheal tube is removed, and a hemostat is placed through the chin incision again. The proximal end of the ET tube is grasped from within the pharynx and pulled out through the skin, leaving the distal (balloon) end in the trachea. The connector is reinserted, and the tube is then hooked up to the anesthesia circuit again. The tube is secured using a stitch under the chin. After a final position check, the surgical procedure can commence. There are a number of variations on this technique, so you may encounter slightly different descriptions. The tube can be pulled at the end of the procedure, or left for a few days to ensure safe extubation, if needed. A small series of 10 patients undergoing this technique was reviewed, and there were no short or long term problems. Scarring under the chin was acceptable, and was probably less noticeable than a trach scar. Bottom line: This is a unique and creative method for intubating patients with very short-term airway needs while their facial fractures are being fixed. Brilliant idea! Reference: Submental intubation in patients with panfacial fractures: a prospective study. Indian J Anaesth 55(3):299-304, 2011.